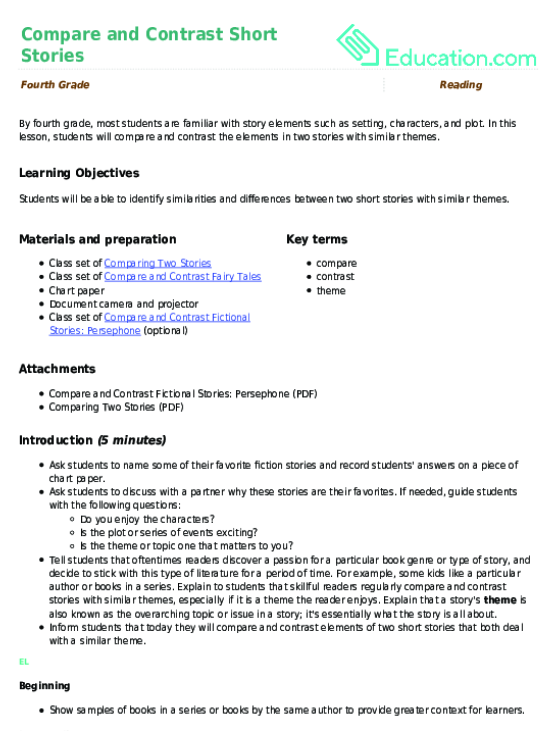 Students will be able to compare and contrast the story elements between two fictional texts. Tell students that today they will look at fictional texts, which are texts about imagined characters and events. Explain to students that fictional texts contain important elements called story elements that enable the story to run smoothly and allow the action to develop in a logical way that the reader can follow. Inform students that these story elements include characters, setting, plot, conflict, resolution, and theme. Tell students that today they will be comparing and contrasting the story elements of two fictional texts. Explain to students that to compare means to look for elements that are similar and to contrast means to look for elements that are different. 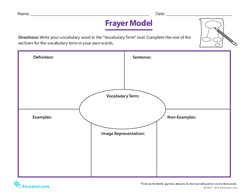 Pre-teach the words "compare" and "contrast" using the Frayer Model. 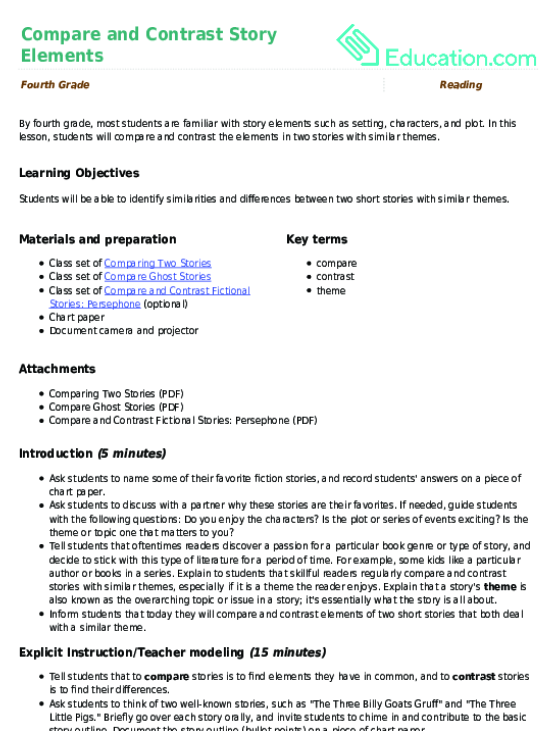 Provide a definition of "story elements" in students' home language (L1). Ask students to define "compare" and "contrast" in their own words after listening to the teacher's description. Post a piece of chart paper on the board with the story elements listed. Call on volunteers to define each of the story elements and provide support as needed. Character is a person, or sometimes an animal, who takes part in the action of the story and who the story is about. Setting is where and when the story takes place. Plot is a series of events and character actions that relate to the main conflict. Conflict is a struggle between two opposing forces. Resolution is the solution to the problem. Theme is the central idea in a story. Write each definition on the chart paper. Tell students that they will compare and contrast these story elements from two different fictional texts. Provide visuals next to each story element (e.g., picture of a castle next to the word "setting"). Allow students to look up unfamiliar words in a home language resource. Provide student-friendly definitions for each story element. Keep this chart poster posted for students to reference throughout the lesson. Project the Compare Story Elements worksheet onto the board. Tell students that we will complete a portion of this table as a class. Write the names of the two stories at the top of the paper. Read aloud the text in the shaded box in each row so that students have a clear understanding of what type of information they should incorporate into this table. 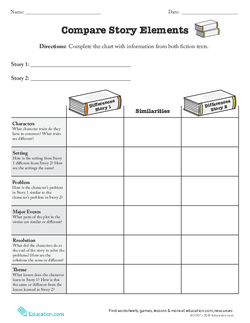 Divide students into small groups and distribute the Compare Story Elements worksheet to each student. Tell students to complete the first two rows of the table in their small groups. Circulate around the groups and provide support as needed. Come together as a group to discuss students' answers and fill in the projected worksheet with their findings. Use visuals (e.g., storytelling cards or a detailed illustration from a picture book) to compare and contrast instead of using books. Group ELs so that advanced ELs can provide support to beginning and intermediate ELs. Ask several students to reread or paraphrase the directions before working in small groups. Assign students to work in a teacher-led group to complete the remainder of the worksheet. Tell students they will complete the remainder of the table independently. Provide ELs with extra time to complete this activity. Provide students with a word bank and/or sentences frames to assist them in completing the worksheet. Provide ELs with a glossary or dictionary in their home language to use when they encounter unfamiliar words. Allow ELs to work with a partner as needed. Pre-teach an introductory lesson on story elements for students needing more practice with this concept. Allow students needing extra support to continue working in a small group during Independent Work Time. Enable students to focus on one or two of the story elements instead of completing the entire table. Provide students with glossaries or dictionaries. Challenge students to add a third column to their table so that they will compare and contrast story elements from three different fictional texts. Provide students with lined paper or writing journals and have them compare and contrast story elements in an essay format as opposed to a table. Project the Compare Story Elements worksheet that was used during the Guided Practice/Modeling section back onto the board. Call on volunteers to fill in each row for the third story. Ask for students to give a thumbs-up if they agree with their classmates' contributions or a thumbs-down if they disagree. Monitor students' responses to gauge understanding. Use visuals (e.g., storytelling cards or a detailed illustration from a picture book) to compare and contrast instead of selecting a third book. Allow students to communicate their ideas orally with a partner before sharing it with the class. Explain to students that being able to determine similarities and differences in stories can help improve reading skills and comprehension. Remind students that today they compared and contrasted the story elements from fictional stories. Ask students to brainstorm a list of other things that you can compare and contrast in fictional texts (i.e., narrator/point of view, author's style, genre, etc.). Allow ELs to choose to communicate their ideas in either English or their home language. Write the reflection question on the board for ELs to refer to. Allow students brainstorm in small groups before sharing with the whole class. 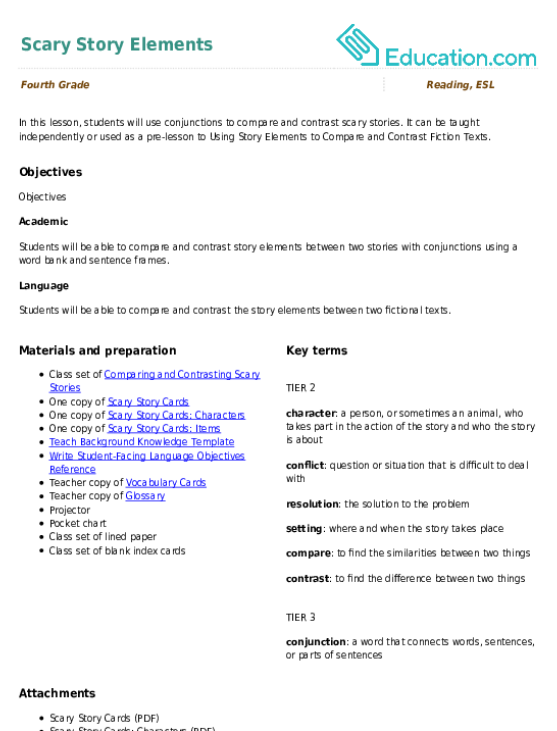 In this lesson, students will compare and contrast the story elements of two fictional stories and document their findings in a graphic organizer. In this lesson, students will compare and contrast the elements in two stories with similar themes. It can be taught independently or used as a pre-lesson to Using Story Elements to Compare and Contrast Fiction Texts. Students will use this graphic organizer to compare and contrast two fiction stories. Get your students thinking about themes as they compare and contrast two different picture books of their choice. Use this reading comprehension worksheet to compare and contrast characters from classic novels using a graphic organizer and paragraph excerpts. 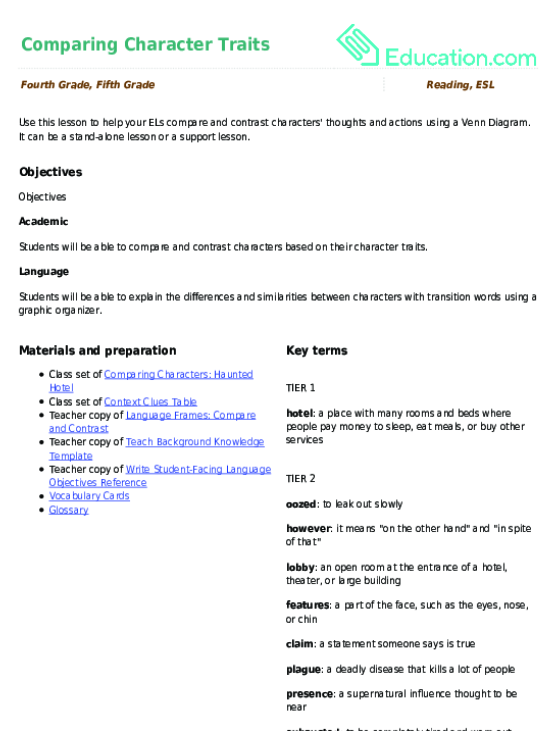 Use this glossary with the EL Support Lesson: Scary Story Elements. Use these vocabulary cards with the EL Support Lesson: Scary Story Elements. Practice comparing and contrasting scary stories using conjunctions to connect ideas. After reading a short story, students will think about how they can connect with the text and use sentence frames to explain their thinking.